Sri Lanka’s Employees’ Provident Fund (EPF), a retirement fund of the private sector workers managed by the state, is about to re-enter the stock market, ending several years of inactivity, after it came under fire for being a dumping ground for both stocks and bonds. The EPF bought stocks at the height of a stock market bubble, which peaked around 2011, earning the doubtful accolade of being the buyer of last resort in the stock market. In 2015 and 2016, the EPF dealers were allegedly involved in a bond fraud, where they stayed away from direct auctions and bought bonds at higher prices from a company connected to the then-Central Bank governor’s son-in-law. Unlike 2011, the stock valuations have hit rock bottom in 2018. This is without doubt a good time to enter the stock market. But does the fund have the necessary skills and most importantly, a robust governance structure, to protect the interest of the EPF members? The answer is no, particularly on governance! The EPF’s fund management is undertaken by the Central Bank under its Monetary Board, which is chaired by a governor and several members, including from the Treasury and private sector. The members of the Monetary Board itself are riddled with multiple conflicts of interest. The Monetary Board is headed by the governor, who amongst other things, is responsible to raise money for the government by issuing treasury bills and bonds. In this role, his objective is to raise money at the lowest possible interest cost to the government. The EPF is one of, if not the largest, investor in government securities. The Treasury secretary too is a member of the Monetary Board. The EPF members’ objective is to maximize the return on their funds. How is this conflict managed by the governor of the Central Bank? We can expect some ethical behaviour from the incumbent governor but what will happen after he goes? The other members are drawn from the private sector. The expansion of the Monetary Board from an earlier three members was supposed to reduce the concentration of power, bring in a private sector perspective and also bring balance by moderating the role of the Treasury. But has this happened? There are concerns that non-ex-officio member have come with their own baggage adding further conflicts of interest to an already murky pot. The current poor level of transparency of the EPF’s activities is completely unacceptable. The EPF does not publish quarterly accounts in a timely manner, which can be accessed by the members in the same way the detailed annual reports are prepared by the large banks and financial institutions. Only the 2016 annual report has been published in the EPF website as of today. The way forward would be to reorganise the EPF in a way similar to the pension funds in developed countries. It is understood that the Labor Ministry has sought the assistance of the Asian Development Bank, to reform the EPF and a white paper has been prepared. However, this is not shared with the EPF members, despite the requests made under the RTI Act to the Labour and Trade Union Relations Ministry. The secrecy could raise suspicions that interested persons are again trying to misuse the EPF with elections close at hand. Already the Perpetual scam, where even the government ministers have got housing benefits, has created a negative perception among the members and trade unions. The fund managers should report their performance every month to ensure competition and transparency, similar to the current practice in the unit trust industry, where the performance is reported on a daily basis. The performance of the professional fund managers can be used as a benchmark and bring in competition and professionalism into the current fund management process at the EPF. The EPF should publish quarterly financial statements like any other listed company in Sri Lanka and have an annual meeting for members. Most global investment funds publish their holdings every month. A large international fund, which bought rupee bonds for example, used to publish its holdings every month. It is ironic that the EPF does not. The EPF should also publish its holdings of stocks every month, so that the members can monitor the changes. The unlisted stocks should be published separately. This can be done for bonds. The governance needs to be overhauled. A separate board should be established for the EPF, consisting of a majority of independent directors representing the members rather than the interests of the Government of Sri Lanka. The directors should not have multiple conflicts of interest similar to the current situation. Given the recent developments, seeing the persons who are seen as friends of politicians being appointed as the members of the Monetary Board does not inspire confidence. A presidential commission of inquiry has already suggested that the governor be appointed by the Constitutional Council. The EPF governing board could also go through a similar process. In the past, the voting rights on the shares held by the EPF have been used to appoint the family and friends of the political leaders as directors of investee companies. There has been not much difference under the current regime, which came promising good governance. Unfortunately, there are no such companies in Sri Lanka. But there are such companies in India already. Institutional Investor Advisory Services India Limited (IIAS) is a proxy advisory firm, which provides the Indian market with independent opinions, research and data on corporate governance issues, as well as voting recommendations on shareholder resolutions. It provides voting recommendations for over 600 companies, where there are large institutional holdings. The EPF can get the services of a proxy advisor from India or some other country. Assistance could be sought from outside the country to set up a unit in Sri Lanka, the same way Fitch (then CBR) was set up in Sri Lanka to start rating. Such firms may help other institutional funds as well. Fundamentally, the EPF should invest in the equity market provide growth for its members. 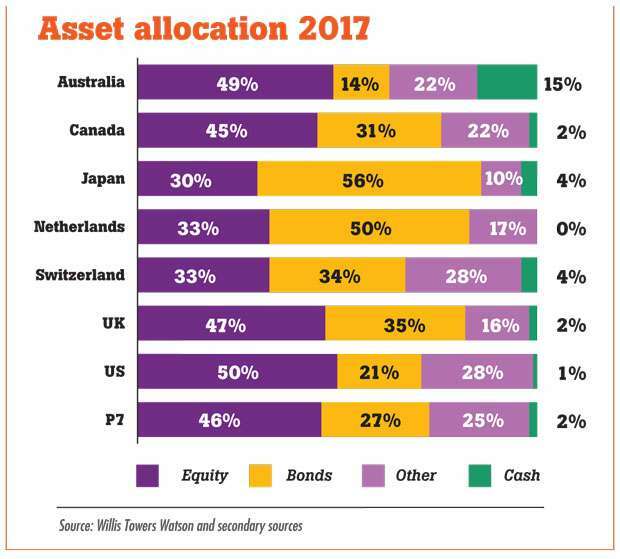 In fact, it should have a larger proportion of the assets invested in the market, similar to the portfolio mix of the pensions funds in other markets. In some developed markets, the public pension funds also invest heavily in real estate. A study by Willis Towers Watson actuaries found that equity forms more than 30 percent of assets of pension funds in major markets. The EPF should be one of the largest shareholders in the country so that the workers can have a share in the companies that drive growth. However, first has to put the policies, procedures and people and get the governance right. By improving transparency and publication of investments, an automatic check will be made against fraud and bad decisions. In the current context, where the EPF membership does not have confidence in the management of the fund, the EPF needs to get its house in order, particularly governance, before embarking on yet another potentially disastrous adventure of investing in the stock market and bond trading. Unlike other countries srilanka has small stock market which is almost fully controlled by colombo base tycoons. So Epf should not invest more than 5% . Epf has only JKH,Rich ,PlC and some banking sectors counters to invest . Srilankan markey is not enough to earn maximum return .better to invest in singaporean market or indian .after carefull ,unbaised research and analysis.